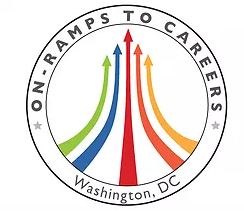 VETS Group and On-Ramps to Careers share a common cause to make economic opportunity accessible to all Washington DC residents and are partnering to advance that cause through in-demand technology training for residents. On-Ramps is using the Vets Group’s newly renovated IT training facility to offer IT training and computer labs for 18 participants through a grant received from the DC DOES Leap program. The LEAP program (Learn, Earn, Advance, Prosper) is a network of interconnected partners utilizing the “earn-and-learn” approach that will link the city’s unemployed residents with employment, education and training opportunities. The earn-and-learn approach applies the apprenticeship model to skill development, allowing individuals to earn a wage while participating in an on-the-job training experience and concurrently participating in related technical instruction. This framework allows individuals to earn wages and accumulate work experience thus bolstering their ability to advance along a career pathway and into the middle class. Starting July 2018 this innovative program will allow participants to receive 18-weeks of Microsoft Windows and Mac computer installation training. In addition, each participant will receive approximately $14/hour for each 8-hour day of training. Upon completion and certification of the training, participants will move into an OJT position with the DC Office of Chief Technology for up to 6 months that could lead to a permanent IT Help Desk position.